Inder Loves Folk Art: Back in knits: Ottobre 1/2014. Back in knits: Ottobre 1/2014. Our household got hit with yet another wretched cold last week, and I've been hearing a never ending chorus of sniffling and coughing for two weeks. Now it looks like I've caught yet another cold on top of the other one I still haven't recovered from? I went to the doctor today, where I was told it's a virus, given a flyer on OTC cold medicines (all of which I'm intimately familiar with at this point, thank you very much), and essentially informed that I just need to soldier through. I know I should be glad that I'm not more seriously ill, but I at the point where am really wishing that my mommy would come and take care of me! Whine whine whine. Thanks for listening. Pity parties aren't much fun if you don't invite all of your friends to participate, right? HA. This is a minor problem in the scheme of things. So anyway, I'm running a bit behind with blogging and finished this make last weekend. With a fun "new" zig-zag machine to play on (and the repair shop called to say my regular machine is ready to pick up tomorrow! 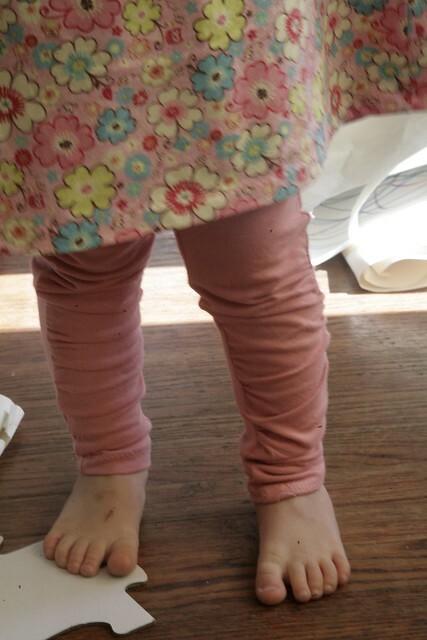 ), I was able to sew up this Ottobre ensemble that I cut out for Maggie before my other machine went kaput. For this photo shoot, Maggie was sniffling and coughing, but she's much better now (whereas I am crying "uncle!"). This little outfit is from Ottobre 1/2014, patterns number 14 and 15, a cute pin-tucked raglan peasant dress and ruched leggings. 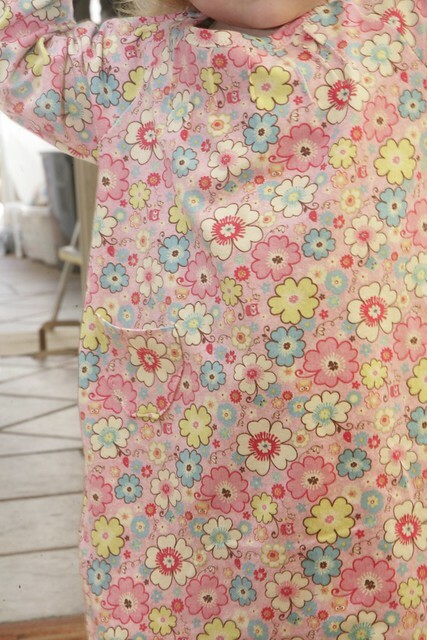 Did you see Rachel's awesome tips for sewing with Ottobre patterns? If you're interested in trying Ottobre patterns, that post is a must-read. She and I are on the same wavelength lately, digging into our Ottobre magazines for fun new patterns. This is the first time I've made an Ottobre pattern for Maggie and I wasn't sure what size to choose. Her measurements are all over the place on their measurement chart. For these two pieces, I chose a size 86 with a little extra length. Well .... okay, yeah, that was silly. They're both too big. I'll size down next time. 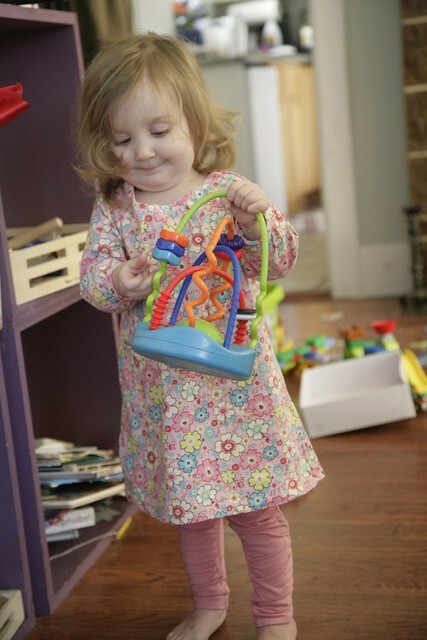 I guess it was wishful thinking that she might be close to size 92, which is the smallest size of many of my favorite girl patterns in Ottobre. Live and learn. She definitely has room to grow into these. The Ottobre instructions called for gathering the sides of the ruched leggings using clear elastic rather than basting and gathering by pulling the bobbin thread. This worked fantastically, was very fast, and has the benefit of being a stretchy finish for knits. Gathering this way requires that you've developed the skill (and it is a skill!) of stretching one layer against another while sewing ... but once you've figured that out, these sew up very quickly. I like the way the ruching looks and it gives an active girl plenty of ease, so I foresee I'll be making more ruched leggings in the future. The dress is made from a Riley Blake jersey, which is really pretty, has great recovery, but curls up on the edges like the very devil. You've been warned. I just do the best I can with these curly jerseys, ironing them right before sewing and keeping things as flat as I can through the machine or serger. I'm hardly a perfectionist, but luckily knits are really forgiving. I felt like the dress was a bit night-gowny, so I added this little pocket, but the print is so busy you'd never even know it was there! 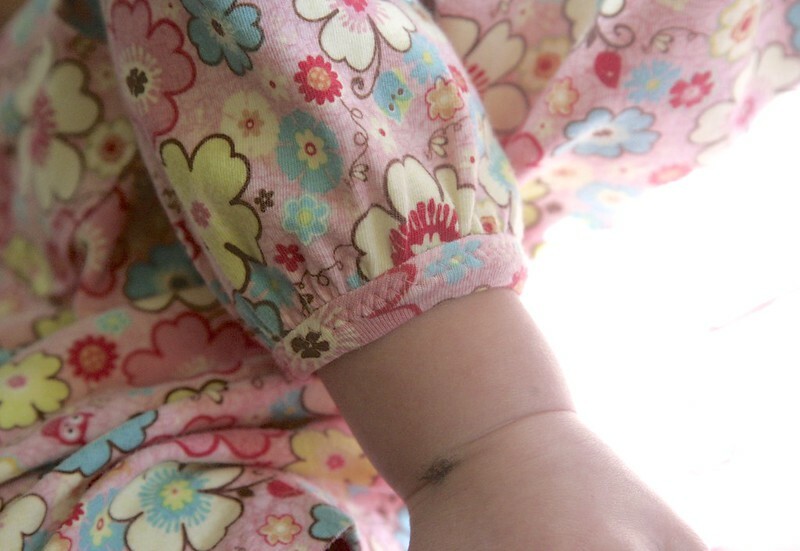 This is the best shot I got of the neckline and the sweet little pleats; it just so happened to be the best shot of Maggie's snotty nose as well. Yeah. Just keeping it real, folks. It's a neverending snot-fest around here. And here are the bound wrists. I haven't figured out how to do a double-needle hem on my old Singer (it doesn't have a second thread spool, and my attempt to improvise one with scotch tape and a dowel did not turn out that well), so I used plain old zig-zag, and you know what? It looks fine. I still don't get the "zig-zag hate" prevalent in the sewing world. I was really happy with how well with the bound neck and wrists turned out on this dress, and here is the reason! 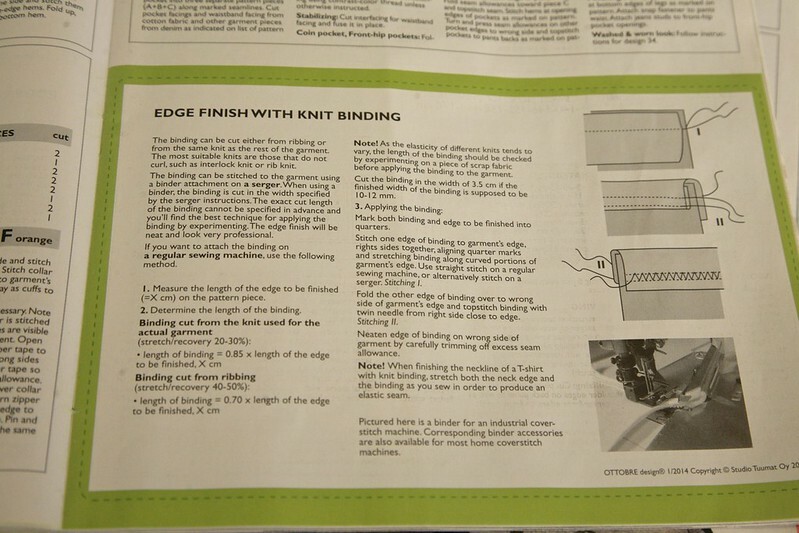 It turns out there are some pretty great instructions for finishing with knit binding in the Ottobre magazine, and I really just needed to follow them! Click on that photo and zoom in if you'd like to read more about the technique. It's pretty basic but for whatever reason I found these visuals really helpful. This was a fun and pretty fast project for Maggie! And in her color d'jour, of course. I'd love to do some striped leggings like in the Ottobre photograph, and I think a solid knit would show off the pin tucks better. This is a very sweet and useful little pattern. And now I need some actual rest and recuperation. I'm sure there will be some sewing too! I just spent about five years cutting out and tiling the Grainline Archer pattern, so that may be coming up soon (featuring: the excellent vintage Singer buttonholer attachment)! Have you been brought low by cold/flu season? What are you working on these days? Very sweet! I recently sewed my first Ottobre pattern, having picked up a couple in an op shop (thrift store). Thanks for including the binding instructions, it's a method I haven't tried but it looks nice and simple. Sorry about all the snot, boo :( A month or so back Andy was away for a week in the US and brought the flu back home with him, so he was back but totally out of action (and quarantined!) for another week. Fortunately my obsessive quarantining worked and it didn't spread! Maggie would look gorgeous in a brown paper bag. But those little ruched leggings are perfection on her, peeking out under that dress. Apparently, I have misplaced this issue! The dress looks great on Maggie! The top I recently made for Iris was outside of her size (chest) measurement, so I just didn't add a seam allowances and it worked out great. I'm not sure if I just got lucky or if it would always work that well. She was only about one size down from the smallest end of the size chart. I like the zigzag stitch on the binding. It looks cute. Maggie's eyes and eyelashes are just the best! Oh, just too adorable! And thanks for the Ottobre tips link, I love Ottobre but don't sew with mine as much as I should. Oh, that is sweet! I'm so intrigued by these patterns. 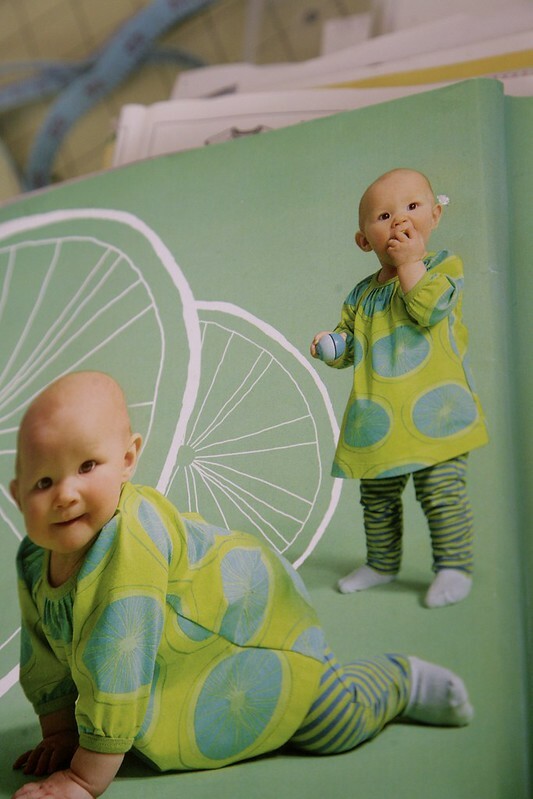 But when I saw the pattern sheet that Rachel posted it cured me of my interest for a bit. All those lines (and then adding seam allowances) made my head swim :) But Maggie sure if sweet. And the patterns in knits really do get so much wear. Oh I thought I'd commented earlier, Hope it's not too late to say get well soon (or to early to say thank goodness you're all better). 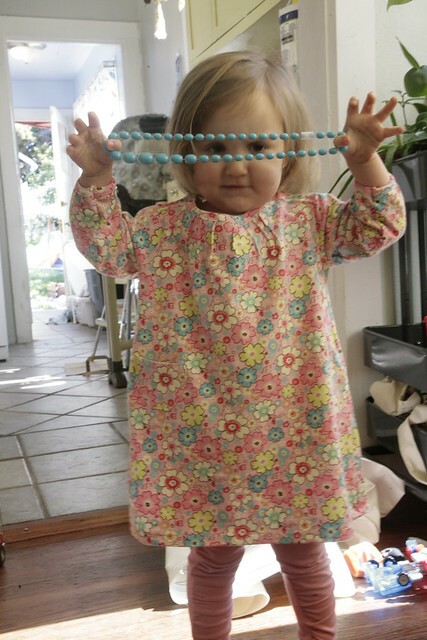 Cute dress, cute snotty kid. great sewing. Oh, cute. I love the ruched leggings. And I also like the zig-zag on the sleeve binding. My machine refuses to zigzag on knits. It won't twin-needle either so I am stuck with the stretch stitch which I think looks like yuck. Knitting can be fun, especially if you are good with your hands and enjoy doing similar activities such as sewing, arts, crafts, and more. Selfish Sewing Week: Grainline Archer.